There are a lot of people on my Christmas gift list that are SUPER important, but that I often put off getting a gift for until the last minute. It’s usually not on purpose, of course, it just sneaks up on me! For example, my kid’s teachers. These ladies and gentlemen are extremely important to me!! I love them and respect them dearly, but the last day of school before vacation ALWAYS creeps up on me! Never fails! I want to get them a meaningful gift that they’ll actually use and let’s face it – I have four kiddos, three in school and one of those in middle school so we are talking quite a few teachers. I have to be thrifty in my gift giving. One idea I absolutely love is to give a movie night gift! I purchase a set of redbox codes from redbox.com and print a cute little tag with their code. You can even spruce it up by wrapping it with a package of microwave popcorn and a cute ribbon. It’s a thoughtful, thrifty gift that my kid’s teachers can use whenever they would like, won’t clutter up their desk nor force them to eat a bunch of candy because it was a gift from their precious angel students. 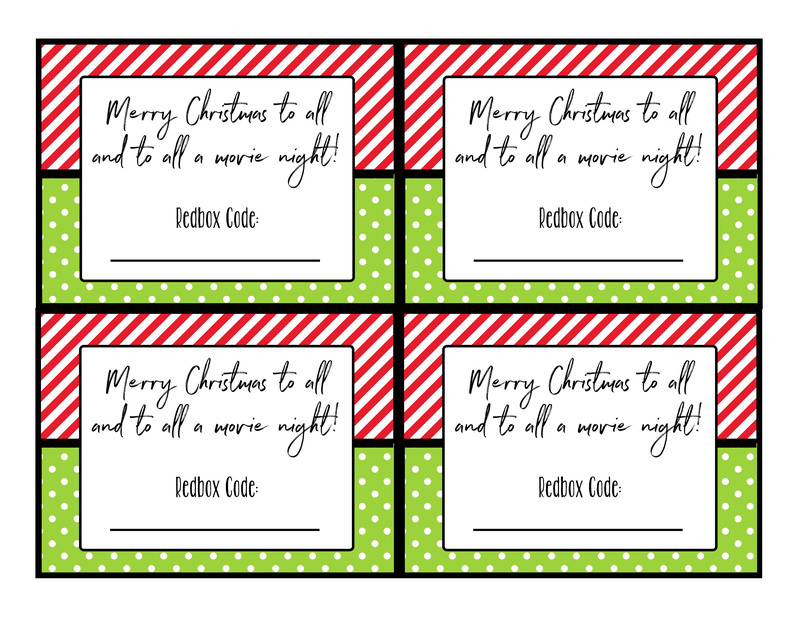 So, if you’re an accidental last minute gifter like me, enjoy these cute Redbox gift card tags and give the men and women who love your kids for 8 hours a day a sweet and non-fattening gift this holiday!